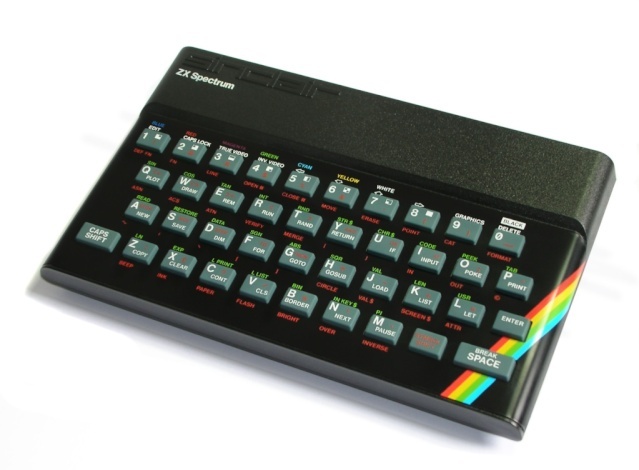 33 years after, the spectrum is back , it's a console version, without keyboard, and it includes 1000 games, ready to play ! The crowfunding needed 100.000 £ to succeed, the goal was reached in 36 hours ! I think it'll still be useful to wedge a door open. Yeah, but if I am not mistaken it is just a (really expensive) Bluetooth keyboard, which you can use as controller for iOS or android devices together with a simulation software. Maybe useful with a PC too. Chema wrote: Yeah, but if I am not mistaken it is just a (really expensive) Bluetooth keyboard, which you can use as controller for iOS or android devices together with a simulation software. If I'm not mistaken the video said you could plug in on any modern TV, so I suspect there's at least some emulator inside too. Chema wrote: Yeah, but if I am not mistaken it is just a (really expensive) Bluetooth keyboard, which you can use as controller for iOS or android devices together with a simulation software. Maybe useful with a PC too. It's not this one, but same sort of mentality behind, I refrain to comment on this project, but most of the speccy user I know are not happy at all about this stuff. I just read ComputerActive's review of this machine - not very flattering. Seems a potentially fun machine is let down by clumsy design. This seems to be the real return ! To be frank I personally don't get the point of these new designs. It is great to have hardware replacements to keep the machine alive, it is great to have new devices to emulate peripherals or make it easier to load things, but a completely new machine? What is the difference between this and a RaspberryPi and emulation software? The keyboard? Well I agree with Chema as long as one sticks to software. But I like the idea of having original extensions working. If a new machine could get us rid of usual problems ("weak signal on expansion port", "how do I plug a modern screen"...) and allow us using 100% of our Oric additional hardware (and why not original keyboards, like Oric-1's to play Zorgons Revenge correctly ! ), I'd buy it for sure. Symoon wrote: If a new machine could get us rid of usual problems ("weak signal on expansion port", "how do I plug a modern screen"...) and allow us using 100% of our Oric additional hardware (and why not original keyboards, like Oric-1's to play Zorgons Revenge correctly ! ), I'd buy it for sure. That's EXACTELY what the Oric Pegasus (NewOric) is! A real Oric with all the connection of the Oric with modern output (and bonus give some new functionalities, but they are only bonuses and not the main reason of this. Oh and no SuperCPU hidden behind, no emulation, just a proper 65C02 or 65C816 with real memory, the FPGA will be here only for replacing the ULA, the AY sound chip as it can't be found anymore, and some of the logic on the oric (plus some of the logic needed for the new features) and as a 65C02 could be use you could even replace it by a NMOS 6502 if you have one! But Exepansion connector will have proper buffered output, a proper video output with SVideo, RGB, VGA and potentially HDMI, Mouse port (why not!) and all the clunky video mode we love with the Oric, but with one overlay that slightly expand the Oric capability, but just slightly, and without changing any of the working of the Oric Atmos. I design the Pegasus as if OPI was trying to make a real successor to the ATMOS with new functionality without breaking the compatibility, so basically not what the Stratos/Telestrat is. I am *ready* to swap the PCB in my Atmos case, Godzil. Let me know when you are ready.